When Swedish entrepreneur, Björn Jakobson started developing baby products in 1961, he had a simple philosophy: to make life easier for parents of small children by developing safe, innovative and premium quality products. Five decades later, BabyBjörn is still a family owned company that stands by its founding philosophy. With an expansive catalogue that includes baby carriers, cradles, high chairs, bouncers, and more. Developed in collaboration with leading paediatricians and medical professionals, BabyBjörn’s Mini Baby Carrier is easy to use for frequent, short babywearing sessions. It’s perfect for the first months when newborns need closeness around the clock. You can easily unfasten the entire front section to lift out your sleeping baby while the soft fabrics gently hug their back, legs and hips to provide good support. Through the fabric, you can check your newborn’s position and the natural C curve of their back with your hands. This carrier has three layers in Black Cotton: An inner layer, an outer layer and a middle layer. The middle layer consists of a fine, single-fibre thread to give the stability of padding, yet ensuring a very good air flow to stay cool and airy. It all adds up to a beautiful experience of keeping your baby close and snug in those first few months. 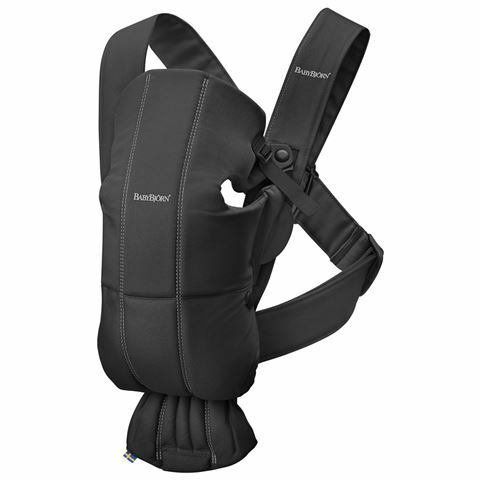 BabyBjorn – for the love of your child. Designed in Sweden in collaboration with leading paediatricians. Crafted from 3D Jersey with three layers for security plus a good air flow. All fabrics are safe for baby’s skin and safe to taste. Approved according to Oeko-Tex Standard 100, class 1 for baby products. Recommended for newborns through to one year olds ( 3.2kg to 11kg). Wide seat area and soft, comfortable materials. Simple adjustments for maximum carrying comfort as the baby grows. Inward Facing Position is ergonomically designed for both you and your growing bub. Outward Facing Position allows the two of you to explore the world together. Minimum age: Five months. Can be used without assistance. Presented in a BabyBjörn box. Size: Newborn from 3.2kg to 11kg.